The Neuberger Museum of Art agrees. From September 11 through December 23, 2016, the Museum will display over forty paintings and drawings by the artist, dating from his Black Mountain College days to the late 1960s in Ray Spillenger: Rediscovery of a Black Mountain Painter, an exhibition which reveals Spillenger’s deep commitment to abstraction and passionate love of color. This is the first exhibition to examine the artist’s unseen body of work and to assess his contribution to the history of mid-twentieth-century American art. The exhibition is organized by Black Mountain College Museum + Arts Center where it was on view earlier this year, and curated by Theodore E. Stebbins, Jr. A full color catalogue accompanies the exhibition. Support is provided by the Friends of the Neuberger Museum of Art, and the Purchase College Foundation. When Ray Spillenger died in 2013 at the age of 89, he was described as “the last of the ‘downtown painters’ – the group of artists living and working in and around 10th Street in New York City, who, in the postwar years, developed the style later called “Action Painting” or Abstract Expressionism. Among the best known of these artists were Jackson Pollock, Willem de Kooning, Hans Hofman, Josef Albers, and Franz Kline, who Stebbins explains in his catalogue essay were the “first generation” abstractionists. Spillenger studied with and befriended many of them. In the 1950s, after a stint in Rome, Spillenger joined the de Kooning-founded artist’s association, The Club, on Tenth Street. 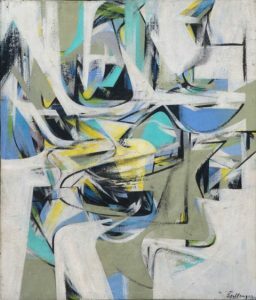 “Abstract Expressionism was strictly an American style invented on 10th Street, and Spillenger was right there when it was being invented,” writes Stebbins. “Spillenger experimented and developed his own non-representational style that featured broad areas of color.” He began making small paintings with broad sweeping brush strokes that blend, rather than dominate, and featuring colors that came from a narrow tonal range. “They evidence a keen interest in how colors work with one another – undoubtedly a legacy of his studies with Albers,” says Stebbins. Spillenger turned to larger canvases in the late 1950s, at a time he began to receive recognition. He also began to experiment with black and white drawings to work out his approach, as encouraged by Kline. The drawings, first figurative, became more abstract, with the later ones almost calligraphic. Then, seemingly abruptly, Pop art took hold. It rejected the Abstract Expressionist aesthetic and reflected a popular culture sensibility. Spillenger eventually stopped painting, putting down his brushes for 15 years. He resumed with new vigor in the 1990s. Works by Ray Spillenger can be found in the collections of the Walker Art Center in Minneapolis and the Hirshhorn Museum in Washington, D.C. The Neuberger Museum of Art, Purchase College, State University of New York is the premier museum of modern, African, and contemporary art in the Westchester/Fairfield County area. An outstanding arts and education institution, the Museum was conceived with the dual purpose of serving both as an important cultural resource to its regional, national, and international audiences, and as an integral part of Purchase College. Support for the Museum’s collection, exhibitions, publications, and education programs is provided by grants from public and private agencies, individual contributions, the Friends of the Neuberger Museum of Art and its Board of Directors, the Purchase College Foundation, and the State University of New York. For persons with special needs, designated parking is available at the south end of the Museum building. Call ahead for wheelchair accommodations. Gallery talks offer fresh insights into the Museum’s special exhibitions and permanent collection, while Topic Tours explore different aspects of the permanent collection. art cards, handcrafted jewelry, children’s items and one-of-a-kind limited edition gifts. The Neuberger Museum of Art is easily accessible by car or bus, and may also be reached by Metro-North. By car: From the North or South – take the Hutchinson River Parkway to Exit 28. Head north on Lincoln Avenue to Anderson Hill Road. Turn right onto Anderson Hill Road. Left at first traffic light into Purchase College campus. From 684 – take Exit 2 South on Route 120 to Anderson Hill Road. Turn left onto Anderson Hill to 2nd traffic light. Turn left at Purchase College campus. From the East – take Route 287 (Cross Westchester Expressway) to Exit 8E. Take second left over Expressway onto Anderson Hill Road. Follow signs to SUNY Purchase. At SUNY purchase follow signs to Parking Lot W-1. On the Purchase College campus, after you have entered the main entrance, make a left at the fork, then a right hand turn on Lincoln Avenue. Take the 1st left hand turn (across from Starbucks) and follow the Neuberger Museum handicap parking sign to the back of the museum (behind cemetery).